SINGAPORE - Bouncing on a trampoline harks back to the carefree days of one's childhood, an activity that busy executives would mostly consider an indulgence these days. But what if you could have fun bouncing and torch some calories at the same time? This is what Bounce Fit, a 45-minute rebounding class that sees participants engage in high-intensity exercises such as mountain climbers and high knees on the trampoline, offers. Originating from Australia, Bounce Fit is a total-body workout that burns up to 900 calories per session and participants of this year's The Straits Times Run can try a class on May 5 as part of the run's build-up programme. Held at Bounce Singapore, an indoor trampoline park at Orchard Cineleisure, there will be three Bounce Fit sessions (9am, 6pm and 7pm) capped at 16 participants per class. There is no minimum age requirement. The low-impact and multi-level nature of the workout makes it ideal for all ages and fitness levels. "A lot of the shock is absorbed when you bounce on the trampoline so the workout is not hard on the joints," said Bounce Fit instructor Izzat Ishamuddin, 26. The trampoline absorbs up to 80 per cent of the impact. While the exercises may be high intensity, modifications are available for those who find it challenging to keep up. "If it's too difficult, you can always do it (the exercise) at a lower level, it really depends on your own fitness level," said Izzat. Better stamina, toned muscles and a stronger core are some benefits of a Bounce Fit session. "It's harder to do squats on the trampoline (than on the ground) because you need to maintain your balance too," said Izzat. "It makes your legs and core work harder." The workout encourages periods of active rest, which means that participants will still be bouncing on the trampoline during "breaks". "You're moving constantly and that is why you're burning (calories) so much, it's good cardio," said Izzat. A study by the National Aeronautics and Space Administration in the United States found that 10 minutes of rebounding torches the same amount of calories as a 33-minute run. Sales and marketing executive Michelle Tan, who has attended multiple Bounce Fit sessions, said: "It's a fun and interactive way to clock in your workout and I feel that my stamina has improved over time. "The class has a good mix of cardio and toning exercises. Best of all, it's done in a fully air-conditioned environment." The build-up to the sixth instalment of the Sept 23 ST Run will feature a range of fitness and lifestyle activities geared towards getting participants ready. 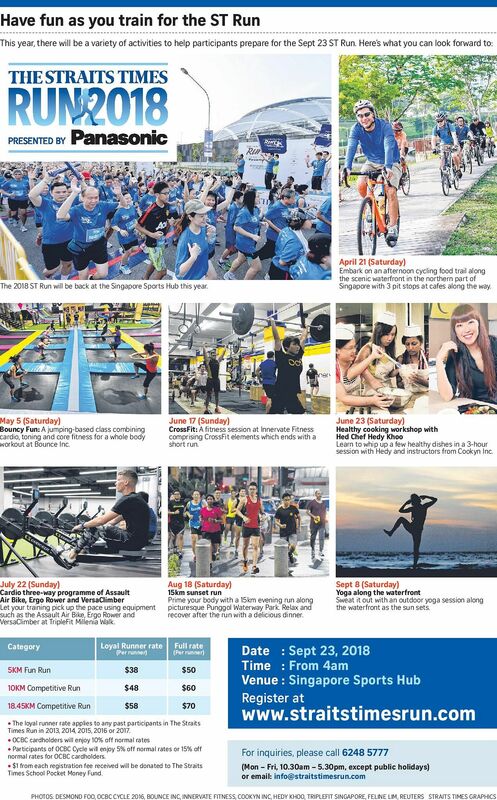 The Bounce Fit session follows Saturday's Eat And Ride session, which saw some 29 people going on on a leisurely 19km ride along the north-east of Singapore with three pit stops - at Seoul Food, Inspirit House and The Summerhouse - along the way. Both activities are firmly in keeping with the theme of having fun while you train for the run, which is key to making exercise routines stick. Besides the Bounce Fit sessions, other activities include a CrossFit session at Innervate Fitness on June 17 and a cardio three-way session at TripleFit on July 22. Registration for Bounce Fit is open to all ST Run participants, but limited to 16 spots per session on a first-come-first-served basis. You may sign up for only one session. Successful registrants need only pay a $5 fee, which will go to the ST School Pocket Money Fund. Visit www.straitstimesrun.com to sign up for the Bounce Fit session in the Pre-run Activities & Workshops section under the Race Info tab.